‘The Rubies’: 17th Edition of the Opera Canada Awards, Oct. 30, 2017 | Karina Gauvin | Dispeker Artists, Inc.
On Mon. Oct. 31, Opera Canada Publications held its 17th annual Opera Canada Awards, a.k.a. the ‘Rubies’. 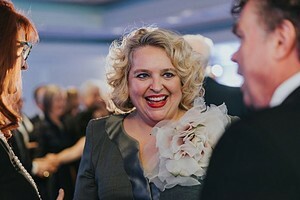 Each year, this event honours three outstanding contributors to opera in Canada, or those who further the cause of Canadians working in opera abroad. The 2017 honourees were conductor Yves Abel, soprano Karina Gauvin and educator/director Michael Patrick Albano. A glittering assembly of opera industry heavy-hitters and fans from across the country gathered on the stunning 68th floor of First Canadian Place in downtown Toronto as a testament to the strength of our nation’s thriving opera scene. The gala is generously sponsored and hosted by BMO Financial Group in their very own ‘West Wing’-inspired event space with its spectacular views of the city skyline and Lake Ontario. Attendees were serenaded by top Canadian singing talent: the Canadian Children’s Opera Company; mezzo-soprano Marjorie Maltais; tenor Asitha Tennekoon; soprano Lucia Cesaroni and their collaborative pianist, Michael Shannon.